One of the most important part of our blogs is the comment section.Especially if you own a huge blog with many visitors and commenters, the comment section design,the easy usage,the features,even the security is very important.I know there are some famous plugins which we use but i made a collection of some different plugins which maybe not known or less known.Here are the 40 plugins for comment section.I redirect the plugins to the original homepages so if you have problems you can ask the the author.The collection is made due to the average ratings of the users. The most powerful comment editing solution for WordPress. Users can edit their own comments for a limited time, while admins can edit all comments. Can edit, de-link, move, mark for moderation, mark as spam, and delete a comment from a post. Can edit in all comment panels in the WordPress admin panel. Can de-spam, approve, moderate, and edit comments in the Akismet panel. It has been found to increase comments and the community spirit for the thousands of blogs that have installed it. With a simple install you will immediately start to find new and interesting blog posts, tweets and diggs from your own blog and community. 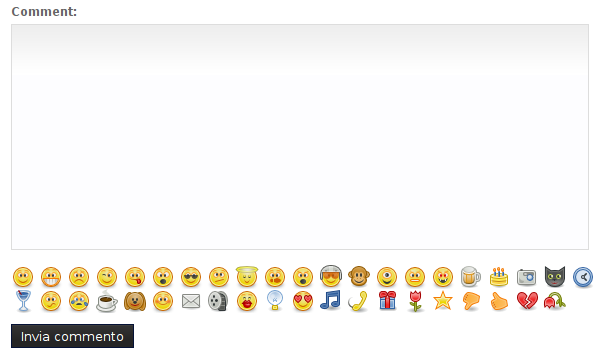 Kaskus Emoticons is emoticons used in kaskus forum. Kaskus it self is the largest Indonesian community that has millions members and posts. Some images here are copyrighted by Kaskus. 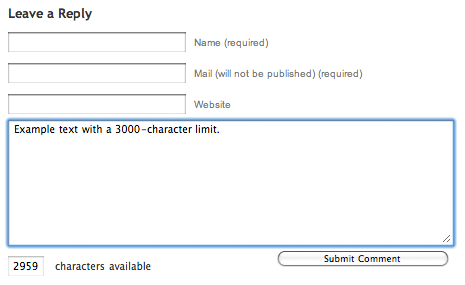 Adds CAPTCHA anti-spam methods to WordPress on the comment form, registration form, login, or all. In order to post comments or register, users will have to type in the phrase shown on the image. This prevents spam from automated bots. Adds security. Works great with Akismet. Also is fully WPMU and BuddyPress compatible. This plugin protects registration, login and comment forms from spambots by adding two extra fields hidden by CSS. 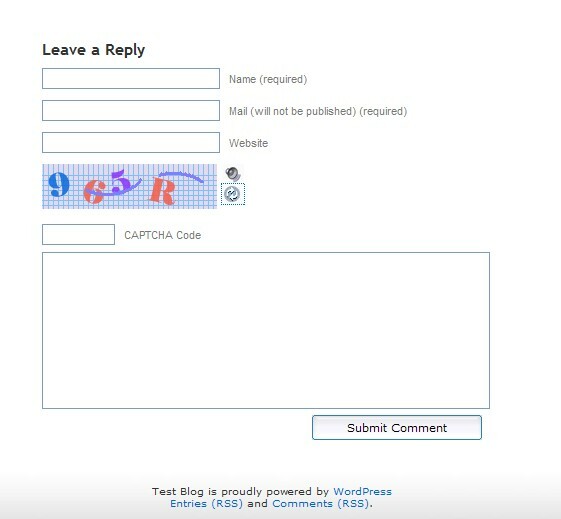 yaCAPTCHA is a CAPTCHA plugin for WordPress that helps you block comment spam from automated bots. In order to post comments, users will have to write down the characters that are part of an image. Since it is relatively hard for automated programs to figure out those characters, this will help prevent comment spam from those programs. 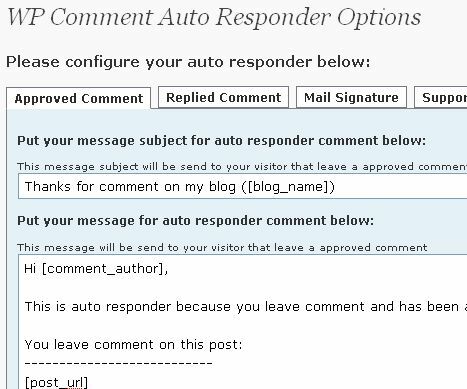 Other feature of this plugin is when you or other visitor reply your visitor comment from your dashboard this plugin will make automatic message, and will tell to your visitor that their comment has replied. 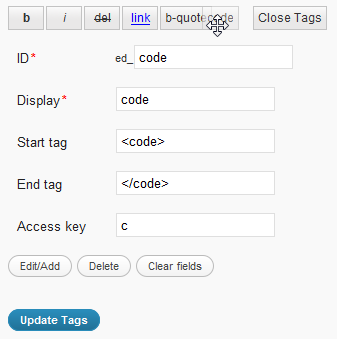 This plugin enables blog admins and editors to manage the notification of incomming comments. 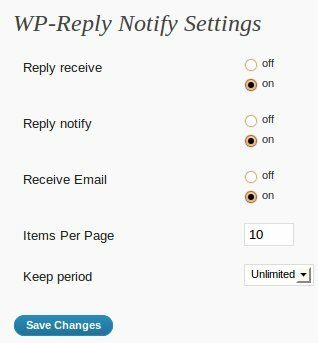 As WordPress only has the option to notify on every comment, the email account of the admin may recieve many email each day. Notification is also limited to the admin only, so only the admin user will recieve an email for incomming comments. Using the plugin you can subscribe to a RSS feed that contains even comments that has to be moderated. Commentwitter is a WordPress plugin that gives commenters the option of Tweeting their comment with a link to your post. This plugin adds a tiny link that says “Quote” on each comment on your posts. Click it, and the contents of the comment is copied to the comment area, wrapped in blockquote tags. 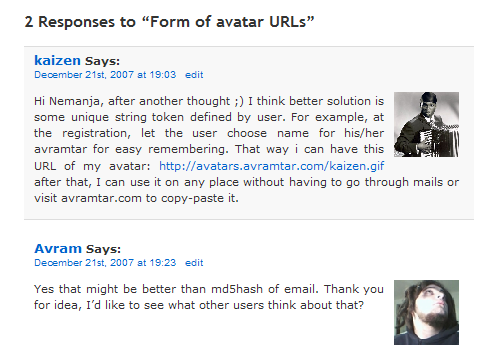 This will vertically scroll the recent comments in site side bar or any desired location with avatar or name or none. User can see the newest comments at sidebar. You can customize the number of recent comments to display. It’s scrolling so it occupies less space in sidebar. the Advanced User Agent Displayer plugin displays the Browser and the operating system of people who commnet on your blog. Currently Support for Desktop and moblie operationg systems and browsers. Browsers: Internet Explorer, Opera, Firefox, Safari, Chrome, Epiphany, Avant, Maxthon, Konqueror and … Platform: Windows(2000, XP, Vista, 7), Linux, Mac, iPhone. This plugin turns the comment field from a primitive <textfield> into a WYSIWYG editor, using the internal TinyMCE library. 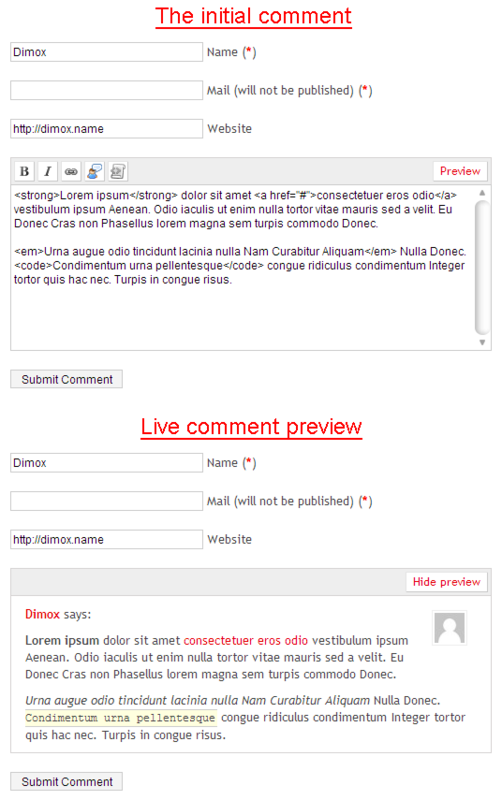 This plugin inserts quicktags of the admin page to the upper part of textarea of the comment form. 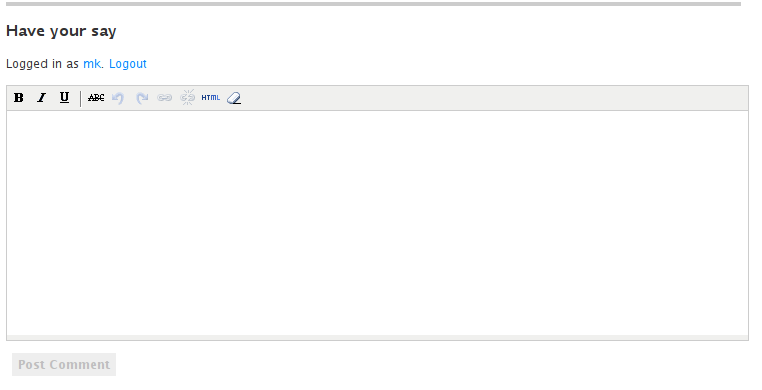 You can edit tags in the admin page. You can limit quicktags by user roles. Enhance the threaded comments system of WordPress 2.7+. When someone reply to your comment, send a email to you. Digress.it lets you comment paragraph by paragraph in the margins of a text.Embed paragaphs YouTube-style on other sites. AVrAmTAR.com is service which allows user to register and upload multiple avatars in their account. After that user will get his unique URL to the dynamic GIF image which will show different avatar (chosen from avatars user have uploaded) each time URL is accessed. Allows you to uniquely style post author’s comments. 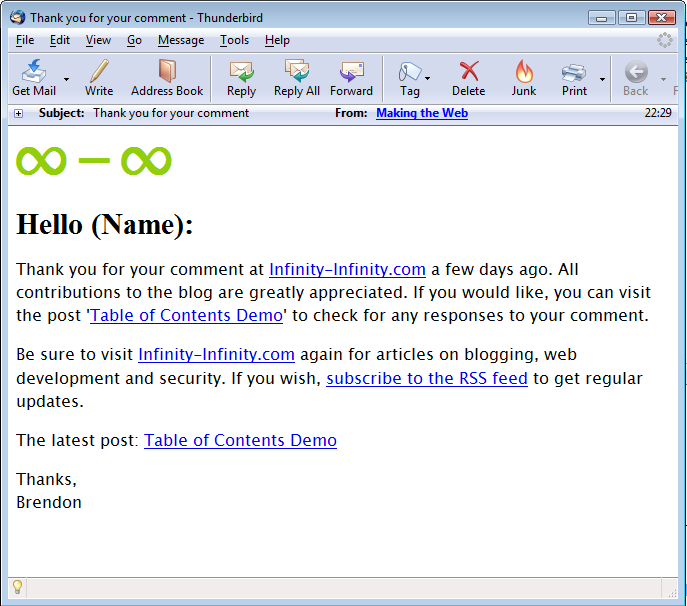 This plugin allows to display or retrieve comments posted by a user. In order to avoid homonyms, a user is identified by his name and email(s). This plugin adds a stylesheet to your blog’s html source code. When a browser loads that stylesheet a cookie is dropped. If that user then leaves a comment the cookie is checked. If it doesn’t exist the comment is marked as spam.Copy into your plugins folder and activate. If you are using a caching plugin such as WP Super Cache make sure you clear the cache after enabling this plugin. 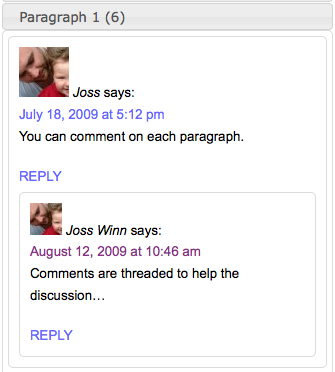 The BackType Connect WordPress plugin finds conversations related to your content and allows you to display the associated comments inline with your own. Existing conversations about your content taking place across the web can now be displayed right on your blog for your visitors to read and respond to. It works on top of your existing WordPress comments, both threaded and non-threaded. If you answer comments, you can get information through the blog address of comments. 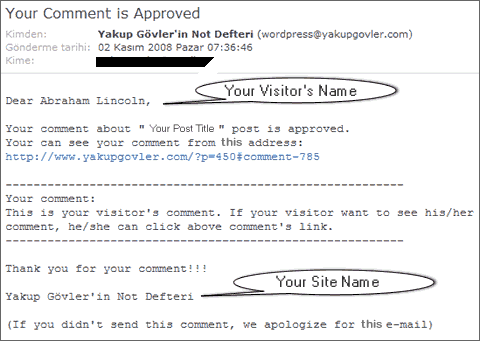 The other way, you can see information about comments other blogs send by admin e-mail. 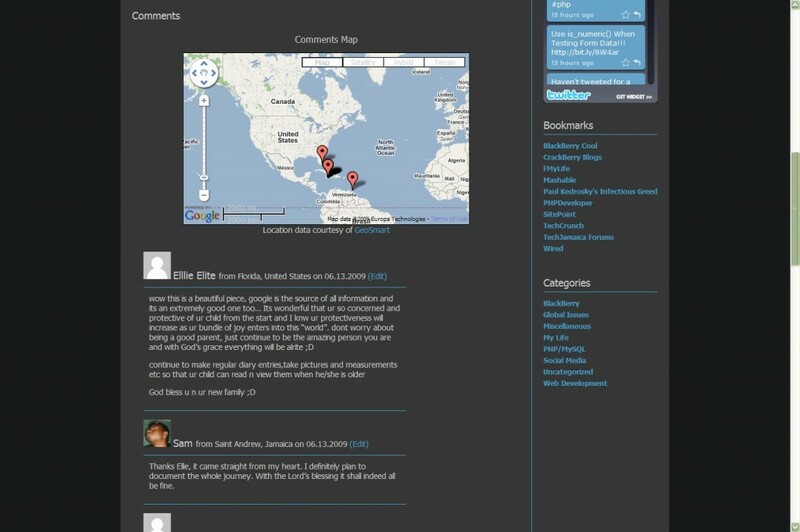 Displays the Gravatars of all your commenters as a nice mosaic in the sidebar of your blog. The plugin is widget ready and comes with many configuration options! 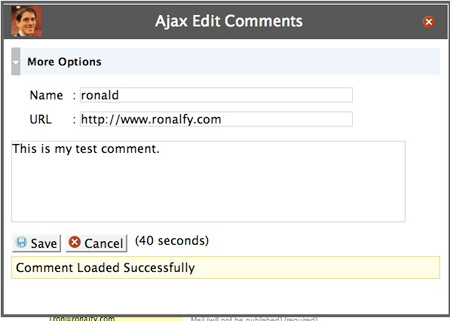 Comment Approved Notifier sends an e-mail to your commenters when you approve their comments. It is a very simple plugin. There are no settings, options. It starts to work when you activate it. Attention: knowledge of CSS and HTML may require for using a plugin. Requires WordPress version: 2.5 or higher. Delink Comment Author gives you the ability to remove the link a commenter left as their URL without removing the entire comment. From the admin listing of posts (‘Edit Posts’) and pages (‘Edit Pages’), a user can close or open comments to any posts to which they have sufficient privileges to make such changes (essentially admins and post authors for their own posts). This is done via an AJAX-powered color-coded indicator. The color-coding gives instant feedback on the current status of the post for comments: green means the post/page is open to comments, red means the post/page is closed to comments. Being AJAX-powered means that the change is submitted in the background without requiring a page reload. This plug-in adds up to six buttons at the end (or the top) of every comments to automatically insert Comments Navigation, Reply and Quote functions. Then you can respond to the author of each comment and quote some or all of its comment. In addition, you can move easily between comments with smooth scrolling. Now you can customize the graphic appearance of button images. Most spam most comes from certain countries. 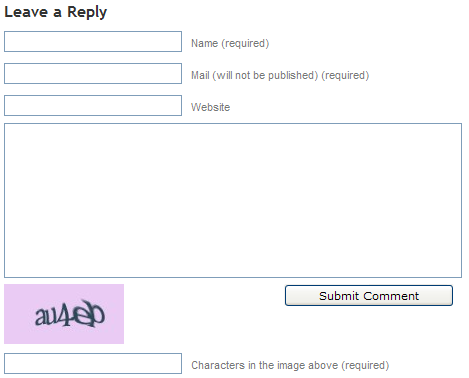 An effectiv method to avoid spam is to add a captcha to your commentbox, but it annoies your human users. 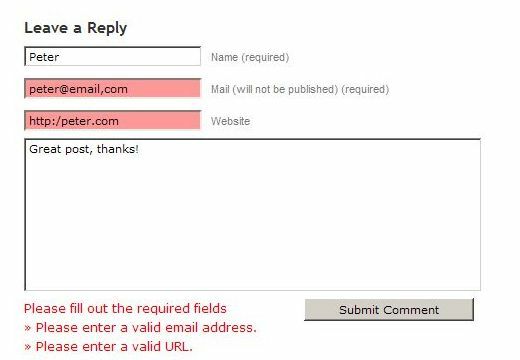 Did you ever see a message like ”please fill out required fields” or ”missing required fields”.This plugin aims to help by adding validation to the comment form. When a user submits the form and something is missing, an appropiate message is displayed and individual fields are highlighted. When the email or url is in an incorrect format, a message is displayed accordingly. Smilies Themer Toolbar provides a toolbar to easily add custom smilies to comments.From v1.0, (WP>=2.5 only) it also integrates into tinyMCE, the rich text editor that you use when you write the posts. It integrates with Smilies Themer plugin, and therefore requires it. Some visitors only comment with just a smile and if this is annoying for you then you can use this plugin.Minimum Comment Lenght plugin as you understand from the name forces to comment for more than 15 characters.If people then leave a comment of less than 15 characters, WordPress dies on them with the message “Error: Your comment is too short. Please try to say something useful.”, or whatever other message you decided to give to them, as this is the second option you can specify in the backend. Banner atau yang biasa kita kenal sebagai gambar pada sebuah site yang memiliki link di dalamnya, merupakan bagian pendukung dari sebuah blog. Tapi tidak baik juga juka kita memasang banyak banner yang tersusun di sepanjang widget atau post. Hal itu sangat memberatkan pengunjung maupun blogger, khususnya yang memiliki keterbatasan kecepatan akses internet. Memang jika blog kita memiliki banyak banner sehingga memberatkan blog kita terpaksa menghilangkan banner-banner itu. Tapi kini ada solusinya, yaitu dengan menggunakan random banner. Jadi kita hanya mengeluarkan misalnya 12 banner, tetapi itu akan tertampil pada blog hanya 6 banner dan sisanya akan di tampilkan secara random jika kita merefresh ulang. Lalu buka file datafeedr-random-ads -> wp-content -> plugins. Buatlah directory bernama “ads” ke wp-content atau bisa upload directory bernama “ads ” ke wp-content. Upload file “datafeedr-ads.php ” ke wp-content/plugins. Buka wp-content/themes/(*theme yang anda pakai)/sidebar.php dan pastekan di bagian yang ingin di tampilkan. Itu baru 1 tempat banner yang terdapat 2 banner, anda bisa menambahkannya 1, 2, 3 hingga banyak tempat banner sekaligus dengan mendoublekan code di atas. Lalu Add Random Ads nya. Klik Done dan klik Save Changes. Setelah itu buka blog anda dan refreslah berulang ulang, banner akan di muncul secara random. Jika masih belum mengerti pulang saja bisa lihat video dari sini. SEO On Page WordPress adalah optimasi yang dilakukan pada web atau blog dari isi halaman blog agar mempunyai pengaruh baik dalam keberadaan blog itu sendiri. Hal ini dilakukan untuk memaksimalkan blog biar cepat dan selalu terindeks google. Kalau web atau blog sering terindek mesin cari seperti Google misalnya akan menjadi nilai positif untuk kelangsungan web atau blog tersebut. Untuk lebih jelasnya baca ulasan berikut. * Kenapa WordPress = jawabannya adalah WordPress adalah Blog Cms yang paling sederhana, Powerfull, SEO friendly, Banyak Pluginnya, dan tentunya relatif aman karena selalu terupdate. Modal apa Saja Buat Menjadikan WOrdpress Blog Kita SEO friendly? * Plugin Global Translator = Buat Translate Blog Kita ke 41 bahasa dan bisa di Include ke sitemap, plugin ini mempunyai SEO bagus karena akan membuat url otomatis hasil translate (chaced), bisa juga di gabung dengan Plugin google xml sitemap support google translate untuk menambahkan ke sitemap. Cuma Robot google yang bisa lihat, sedangkan pengunjung tidak bisa. Berawal dari euforia temen2 elins dalam membuat blog. Kemaren temen saya sebut saja Azwar -nama sebenarnya- googling untuk mengetahui cara “mempercantik wordpress”. Mungkin yang dia maksud adalah cara mempercantik blog yang menggunakan wordpress. Namun jangan salah biarpun masih awam banget dunia blog. Dia sudah cukup mahir untuk membuat berbagai robot dan bahkan mengalahkan saya dalam main warcraft. Kemudian terbetiklah hasrat saya yang gak mau kalah ini,untuk membuat sedikit tips cara mempercantik blog tampilan wordpress. *itung2 biar kalah di warcraft tapi gak mau kalah di bidang yang satu ini.hhaha ampun war..
Oke nih sedikit tips dan trick tentang cara mempercantik tampilan blog wordpress anda. 1. Pilih theme atau template yang sesuai dengan isi blog anda. Pilih theme atau template yang sesuai dengan isi blog anda. Misal blog anda untuk catatan pribadi, curhat,berbagi info bisa dengan memilih theme yang menonjolkan tulisan. Bila untuk blog bisnis bisa memilih yang menyediakan banyak space iklan. Tapi jangan lupakan isi content juga harus terlihat. 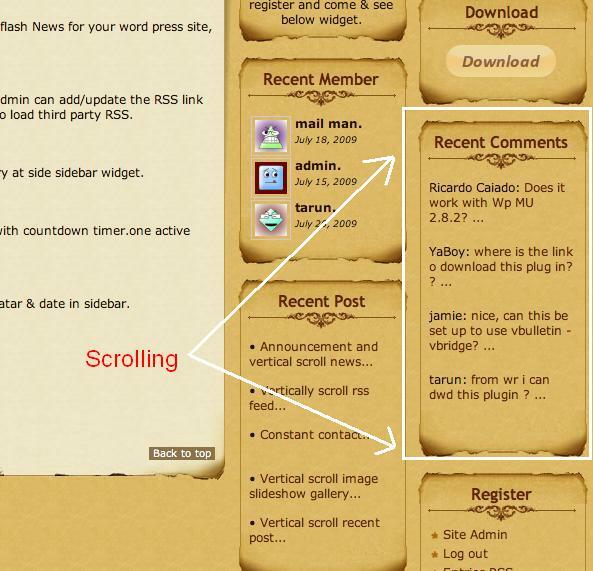 Untuk mengganti theme anda masuk ke account wordpress anda->appearance->theme. Klik disini untuk memilih theme wordpress. Bila anda ingin mempercantik tampilan blog anda bisa dengan menambahkan plugin. Sesuaikan dengan kebutuhan dan tampilan. Contohnya anda ingin menggunakan “bola” tags dan categories,gunakan wp-cumullus. Atau ingin menambahkan tab pages sendiri gunakan dTabs. Untuk menambah atau memilih plugin anda bisa klik Plugins->add new. Setelah itu tinggal di installl dan diedit. Klik disini untuk memilih plugin wordpress. Di appearance anda akan menemukan pilihan widget dibawahnya. Nah disana anda bisa menggunakannnya untuk memasukan backlink blog anda. 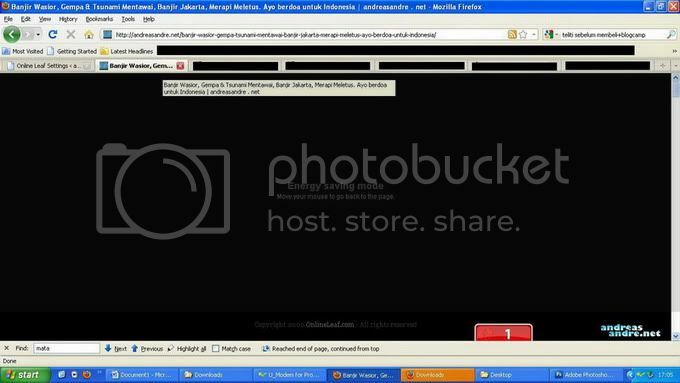 Menambahkan status yahoo messenger di blog anda. Atau box chat juga oke. Jika anda ingin menambahkan widget disidebar tinggal klik widget yang anda inginkan. Jika tidak ada pilihannya disitu pilih text->add dan masukkan kode html di situ. 4. Percantik tampilan blog anda dengan gambar. Anda bisa memasukkan gambar saat posting. Atau menaruh gambar anda dan sedikit info blog anda di sidebar. Namun jangan banyak2 jika anda bukan membuat blog galleri fotografi. Nanti berat untuk di akses orang,jd sedikit pengunjung deh. Segitu dulu ya beberapa tips dan trick mempercantik tampilan wordpress anda. Selamat mencoba. Sekarang ini sudah sangat umum untuk menemukan orang-orang browsing web menggunakan ponsel mereka. Banyak ponsel membanjiri pasar dengan harga yang terjangkau dan tentunya membantu Anda untuk browsing internet dengan mudah. Jadi, selalu berpikir bijaksana untuk membuat blog Anda lebih mudah diakses oleh mereka yang melihat blog Anda di handset mobile mereka. Saya memiliki sejumlah plugin yang benar-benar membantu WordPress sehingga menyelamatkan kita dalam situasi seperti ini. Di sini, saya telah mendaftarkan 8 plugin WordPress terbaik yang membantu Anda untuk membuat blog Anda lebih bersahabat dengan perangkat mobile. Mobile Admin menyesuaikan UI WordPress Admin untuk lebih mudah diakses ke perangkat mobile, khususnya ponsel. iPhone / iPod Touch browser adalah target utama, tetapi browser ponsel lain juga didukung pada tingkat dasar, dan plugin ini dapat digunakan untuk menyesuaikan browser tertentu. WordPress Mobile Edition adalah plugin yang menunjukkan sebuah antarmuka yang dirancang untuk perangkat mobile ketika pengunjung datang ke situs Anda pada perangkat mobile. Mobile browser secara otomatis terdeteksi, daftar mobile browser dapat dengan mudah disesuaikan pada halaman pengaturan. Setelah diinstal, apapun jenis ponsel yang mengakses URL Anda, akan diarahkan ke render Mippin blog Anda. Mippin membuat sempurna untuk setiap tipe ponsel. Bahkan iPhone membuat blog Anda lebih baik dan lebih cepat daripada pergi ke URL PC langsung. Tampilan situs mobile yang diberikan dapat secara optional dikonfigurasi oleh pemilik situs blog dan dia dapat menambahkan iklan juga dan mendapatkan 100% dari pendapatan iklan seluler. Layanan ini benar-benar gratis. WordPress Mobile Pack adalah toolkit yang lengkap untuk membantu memobilisasi situs WordPress dan blog Anda. Ini termasuk mobile switcher untuk memilih tema berdasarkan jenis pengguna yang mengunjungi situs, pilihan tema mobile, widget ekstra, adaptasi perangkat dan sebuah panel administrasi mobile untuk memungkinkan pengguna untuk mengedit situs atau menulis posting baru. Mobify adalah layanan web yang memungkinkan untuk menyesuaikan setiap komponen lebih indah, mengadaptasi untuk lebih dari 5.000 perangkat. Plugin ini mendeteksi perangkat mobile dan mengirimkannya ke URL mobile yang sesuai. Anda harus mendaftar untuk meminta akun Mobify gratis di http://mobify.me untuk menciptakan dan mengelola versi mobile. MobilePress adalah plugin WordPress gratis yang mengubah blog WordPress menjadi lebih mudah bila dilihat pada ponsel. MobilePress juga memungkinkan Anda untuk membuat tema mobile kustom untuk perangkat genggam yang berbeda dan browser mobile seperti iPhone, Opera Mini dan Windows Mobile. Ini adalah plugin yang telah memenangkan penghargaan dan menciptakan pilihan halaman login untuk menggantikan antarmuka default admin yang dirancang untuk ponsel Anda. Plugin ini untuk digunakan WordPress versi terbaru, tapi akan bekerja juga dengan versi 2.1 dan yang lebih baru. Wetomo (Web to Mobile) adalah layanan yang memungkinkan penerbit untuk menampilkan konten web yang ada untuk pengguna pada ponsel dan perangkat genggam lainnya. Plugin ini mendeteksi ketika pengguna sedang di ponsel dan secara otomatis diarahkan ke Wetomo, yang bertindak sebagai proxy antara ponsel dan situs WordPress dan menyesuaikan konten situs web dengan kemampuan ponsel. Apakah Anda menginstal salah satu plugin di atas dalam blog WordPress Anda? Berapa persentase jumlah pengunjung yang melihat blog Anda dengan menggunakan perangkat mobile? Tutorial kali ini mengenai bagaimana caranya memasukan gambar( image ) ke artikel anda, seperti yang anda lihat di kiri artikel saya ini. Sebelum saya menjelaskan bagaimana caranya memasukan gambar ke artikel, ada baiknya anda siapkan dulu gambarnya dan saya rekomendasikan gambar anda jangan lebih dari 200x200px apabila anda ingin memasang gambar tersebut di sebelah kiri atau kanan artikel. 1.Silahkan anda login ke wp-admin. 2.Lihat kiri anda, ada menu Posts klik pada tanda panah yang ada di sebelah kanan Posts agar memunculkan menu drop down. 3.Setelah itu anda klik Add New. 4.Setelah masuk ke halaman untuk membuat artikel anda cari kotak kecil tepat di sebelah tulisan Upload/Insert.Lihat gambar di bawah ini. 5.Klik pada kotak kecil tersebut.Lalu akan muncul gambar berikut. 6.Klik pada Select Files.Kemudian anda tinggal pilih gambar yang akan di pasang pada artikel anda. WordPress is by far the most popular blogging platform. It is easy to use and infinitely customizable. One of my favorite features of WordPress is the “advanced” version of the text editor used to write posts. For some reason this option isn’t enabled by default nor is there a box in any of the options to make it appear. You have to know the “code”. It makes it very easy to write the word green in green, red in red; insert special characters like © or ™ or even ®. You can also paste text from a word formatted document, change the heading type (H1, H2, paragraph, etc. ), clean up messy code, undo, and underline. Now you can do it all with 60+ options including: superscript, subscript, emoticons, media (Flash, Shockwave), tables and SO much more. Tip: Be sure to read the readme.txt in the extracted folder. Go crazy and get the upgrade to the ultimate WordPress text editor. Jika temen-temen mengamati halaman home blog tersebut, attribute title blog yang berada dibawah Judul tiap posting berupa dua buah kotak. Kotak pertama berwarna abu-abu berisi jumlah komentar dan tanggal dipublikasikannya posting tersebut yang dipisahkan tanda “/” (garis miring). Pada kotak kedua berisi author/penulisnya. Namun jika kita masuk ke halaman single post, attributnya bertambah satu lagi yaitu Views. Views disini adalah jumlah pengunjung yang sudah membuka halaman posting tersebut. Ada juga yang menyebutnya dengan hit counter. Contohnya saat saya membuka posting terakhirnya muncul 201 Views seperti pada gambar dibawah. Setelah browsing kesana-kemari ternyata susah juga mencari tutorial yang membahas ini. Jika ingin melihat demonya sekalian tutorialnya bisa dilihat di indo-template-blogger.blogspot.com. Penghitung jumlah pembaca posting blog terletak dibawah entry tulisan blog tersebut. Buat kita yang menggunakan wordpress self host seperti halnya juga bro Satrya, kita bisa memanfaatkan plugin Top10 dan WP-PostViews. Kedua plugin ini mempunyai fitur untuk bisa dipasang pada sidebar. Pada instalasi plugin Top 10, saya hanya bisa menampilkan informasi “Visited 1 times, 1 visits today“) di bawah entry tulisan. Tapi bukan seperti itu yang saya inginkan. Saya ingin seperti yang ditampikan pada blog bro Satrya diatas tadi. Meskipun plugin ini banyak sekali fiturnya tapi saya masih tetep binggung menggunakannya. Namun akhirnya berhasil juga menggunakan versi 1.40 ini. Untuk pengaturan lainnya silahkan masuk ke Setting > PostViews. Saat ini pemerintah memang sedang menggalakkan program hemat energi, mulai dari program 19-22, yaitu untuk menghemat pemakaian listrik pada pukul 19.00 sampai 22.00, bike to work untuk mengurangi penggunaan bahan bakar minyak, dan konversi minyak tanah ke gas. Tapi taukah teman-teman, ternyata sebagai blogger kita juga bisa menghemat energi. Pada kasus ini, penggunaan warna gelap pada komputer lebih membutuhkan sedikit energi daripada menampilkan warna yang terang. Dengan menyembunyikan elemen animasi, seperti flash atau lainnya, maka akan membantu mengurangi kinerja hardware dalam menggenerate website. Semoga cara ini bisa membantu melakukan penghematan energi. Untuk mendapatkan posisi yang bagus di Search Engine tentu saja blog anda harus mempunyai backlink dan link popularity yang banyak.Seperti yang sudah saja jelaskan mengenai backlink dan apa saja manfaatnya pada artikel 100 backlink gratis, sudah jelas anda akan sangat membutukan backlink yang banyak untuk memperbaiki posisi blog di Search engine. Mungkin anda juga ingin tahu berapa banyak backlink yang sudah anda dapat selama ini, oia backlink pun sangat berpengaruh dalam peningkatan Pagerank, semakin tinggi Pagerank semakin berkualitas blog anda di mata Search Engine. Berikut 5 tools online yang bisa anda gunakan untuk mengecek berapa banyak backlink yang blog anda dapatkan.